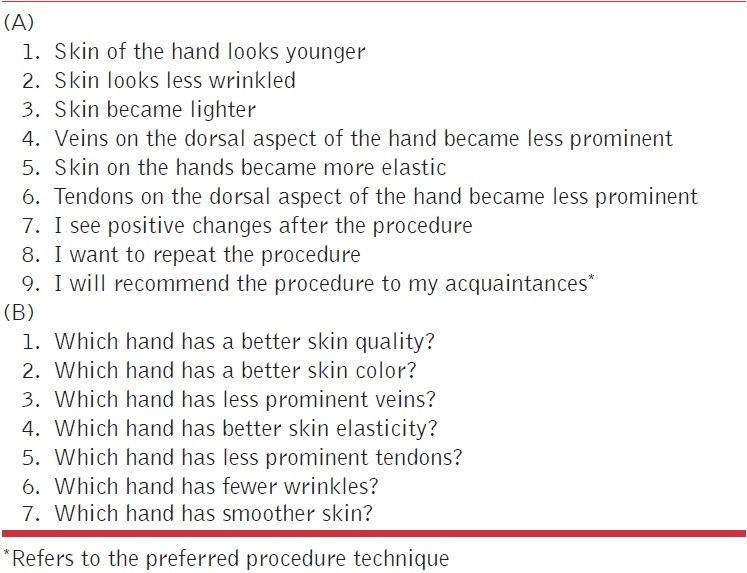 Background: Dermal fillers are used to correct age-related changes in hands. Aims: Assess efficacy and safety of two injection techniques to treat age-related changes in the hands using calcium hydroxylapatite filler, Radiesse ® . Settings and Design: This was a prospective, comparative, evaluator-blind, single-center study. Materials and Methods: Radiesse ® (0.8 mL/0.2 mL 2% lidocaine) was injected subdermally on Day (D)01, using a needle multipoint technique in one hand (N) and a fan-like cannula technique in the other (C). Assessments were made pre-injection, on D14, Month (M)02, M03 and M05 using the Merz Aesthetics Hand Grading Scale (MAS) and Global Aesthetic Improvement Scale (GAIS). Participants completed questionnaires on satisfaction, pain and adverse events (AEs). Statistical Analysis Used: Data distribution was tested with the Shapiro-Wilk and Levene's tests. The Wilcoxon signed-rank and Chi-square tests were employed to evaluate quantitative and qualitative data, respectively. Results: All 10 participants completed the study, four opted for a M03 touch-up (0.8 mL Radiesse ® ). Evaluator-assessed mean GAIS scores were between 2 (significant improvement but not complete correction) and 3 (optimal cosmetic result) at each time point. The MAS score improved from D01 to M05 (N: 2.60 to 1.40; C: 2.20 to 1.30). Following treatment, participants reported skin was softer, more elastic, more youthful and less wrinkled. Other than less noticeable veins and tendons on the C hand, no differences in participant satisfaction were noted. All AEs were mild, with no serious AEs reported. Conclusions: Both injection techniques (needle and cannula) demonstrated equivalent clinical efficacy with a comparable safety profile for the correction of age-related changes in hands with Radiesse ® . A dermal filler based on calcium hydroxylapatite (CaHa; Radiesse ® , Merz Pharmaceuticals GmbH, Frankfurt, Germany) has been shown to restore hand volume and can be used in combination with other hand rejuvenation modalities. The techniques used in clinical practice to administer products such as Radiesse ® vary according to physician preference and experience. Ideally, the same dose of a given product would achieve comparable aesthetic outcomes regardless of the injection technique used. However, there is a paucity of literature concerning the impact that different injection techniques might have on the aesthetic outcome achieved and any safety considerations related to one or both techniques. The objective of this study was to evaluate the efficacy and safety of two different injection techniques for hand rejuvenation using Radiesse ® . This prospective, comparative, evaluator-blind clinical study was carried out between January 2013 and July 2013 at a single center in Moscow, Russia, and was performed in line with local and international regulations. The study was approved by the local Ethical Committee of Vallex M Clinic, Moscow. All study procedures were carried out in accordance with the Declaration of Helsinki. Women between 40 and 65 years of age, with a score of 1-4 according to the validated Merz Aesthetics Hand Grading Scale (MAS; a 5-point scale for assessment of hands; [Figure 1])  and body mass index (BMI) <25 kg/m 2 were eligible for inclusion in the study. Informed consent was obtained from each participant. Exclusion criteria included pregnancy; any cosmetic procedures or injections in the treatment area within the last 6 months; previous injections of permanent fillers in the treatment area (including fat transplants); previous surgery or scars on the dorsal area of the hands; and excess of subcutaneous fat or hypertrophy of muscles in the hand. A topical anesthetic (EMLA ® 5% cream; AstraZeneca AB, Sweden) was applied to the hands of each participant, 20 minutes before injection. 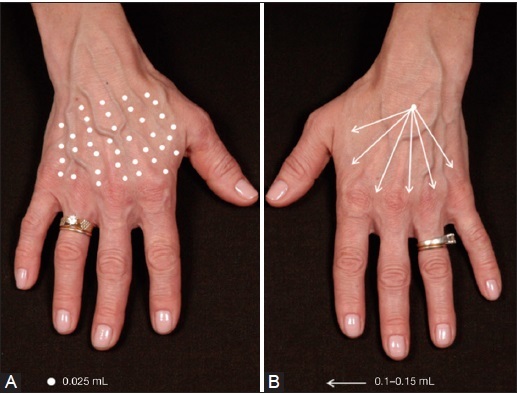 With their vision obscured, participants were injected in one hand (N hand) with 0.8 mL Radiesse ® mixed with 0.2 mL 2% lidocaine solution using uniform multipoint needle (27 G) injections [Figure 2]a. In the other hand (C hand), injections were performed using a blunt cannula (25 G; 50 mm) in the upper subdermal layer (depth of 2-3 mm) in a fan-like distribution [Figure 2]b. Following each injection, hands were massaged. At Month 3, additional touch-up injections could be performed according to participants' wishes using the same procedures as described previously. Participants' hands were evaluated for skin quality before treatment (Day 0, baseline) using the validated MAS, which is a 5-point photonumeric rating scale. Adverse events (AEs) were evaluated at 0, 30 and 60 minutes after injection. Thereafter, assessments took place at Day 14, Month 2, Month 3 and Month 5 post-injection. At each assessment, standardized digital photographs (9 × 12 cm) were taken using a NIKON D100 camera, with the same hand position, background and lighting conditions used for each hand. Assessments of hand skin quality from the photographs were carried out by one of two independent evaluator physicians blinded to the treatment procedure. Participants completed two questionnaires that assessed skin condition of the hands and treatment satisfaction. A final follow-up was performed by telephone call at Month 6. Given that the efficacy and safety of Radiesse ® has been demonstrated elsewhere, the study duration of 5 months was deemed sufficient to meet the objectives of comparing the efficacy and safety of two different injection techniques using Radiesse ® . Treatment efficacy endpoints firstly comprised improved score on the Global Aesthetic Improvement Scale (GAIS)  assessed by both participant and evaluator at Day 14, Month 2, Month 3 and Month 5, and secondly comprised responder rates defined as the proportion of women with an improvement versus baseline of ≥1 and ≥2 points on the MAS. Satisfaction with treatment was assessed using a questionnaire titled 'Satisfaction with results of the procedure', which participants completed at Day 14, Month 2, Month 3 and Month 5. In response to nine statements about treatment results, an 11-point scale was used, where zero meant 'disagree with the statement' and 10 meant 'absolutely agree with the statement' [Table 1]a. The questionnaire titled 'Comparative assessment of skin conditions of the hands' was completed by participants on Day 1, Day 14, Month 2, Month 3 and Month 5 [Table 1]b. Participants were followed up by a telephone call at Month 1 post-injection. Sensation of numbness using an 11-point scale, where zero corresponds to the absence/minimal presence of a symptom/sign and 10 corresponds to the maximal intensity of a symptom/sign. v 20.0 (IBM Corp., Armonk, NY, USA). Data distribution was tested with the Shapiro-Wilk test and the Levene's test. Owing to the small sample size, and as the data did not display normal distribution, non-parametric methods were used. The Wilcoxon signed-rank test with a level of significance <0.05 was employed to evaluate dynamics for quantitative data and the Chi-square test, with the same level of significance, was used to evaluate qualitative data. Ten women entered and completed the study. The mean (standard deviation; SD) age of participants was 49.5 (±6.0) years and the mean BMI was 22.8 (±1.5) kg/m 2 . The mean (SD) scores on the MAS were 2.60 (±0.84) for N hand and 2.20 (±1.14) for C hand. Four of the subjects opted for a 1.0 mL touch-up injection in each hand at Month 3. These four subjects showed a less positive satisfaction score on the GAIS at Month 2 compared with other study participants. Evaluators reported mean scores on the GAIS of 2 (significant improvement but not complete correction) or greater and less than 3 (optimal cosmetic result); mean scores within this range were maintained from Day 14 to Month 5, irrespective of injection technique used [Table 2]. Participant-assessed mean scores on the GAIS were between 2 (satisfied with the result but wishes it was slightly better) and 3 (completely satisfied with the result) at every time point regardless of the injection technique employed, with the exception of a mean score of 1.8 at Day 14 for the N hand [Table 2]. According to participants, on Day 14 there was a trend towards greater aesthetic improvement with the fan-like distribution of injections (C hand) compared with multipoint injections (N hand; P = 0.03). There were no statistical differences in GAIS scores between the two injection techniques during the study. Responder rates (responders defined as participants with at least a 1-point improvement from baseline on the MAS) were the same for both injection techniques up to Month 2. 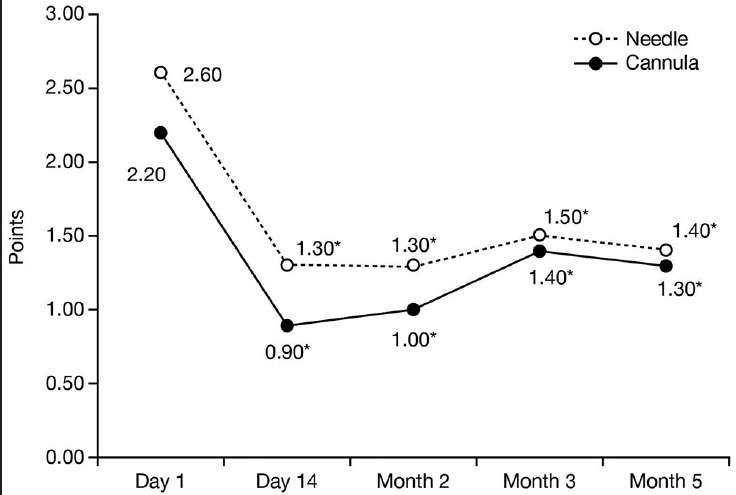 Thereafter, slightly higher response rates were seen in the N hand compared with the C hand [Figure 3]; P = 0.87 at Month 3 and P = 0.71 at Month 5). A similar trend, but with overall lower response rates, was seen when responders were defined as participants with at least a 2-point improvement from baseline on the MAS. 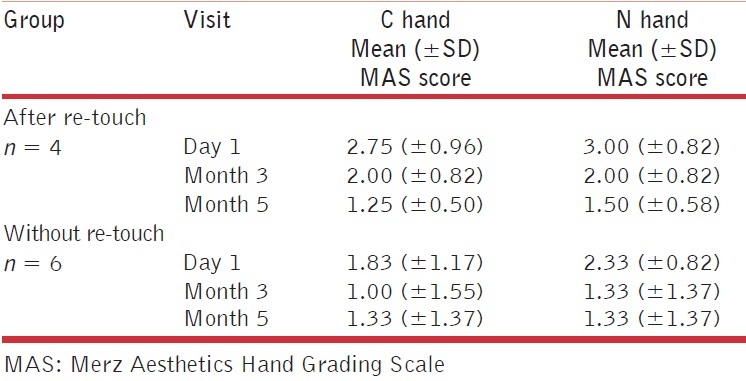 Improvements in scores on the MAS were similar between those who received additional touch-up injections and those who did not, regardless of injection technique [Table 3]. With respect to changes in MAS mean scores over time, by Day 14 there was a significant improvement versus baseline in the N hand (P = 0.005), which was maintained at a similar level thereafter [Figure 4]. In the C hand there was a more than two-fold decrease versus baseline by Day 14 (P = 0.005) that was maintained at Month 2 (P = 0.005). Lower scores versus baseline were also recorded for the C hand at Month 3 (P = 0.01) and Month 5 (P = 0.03); however, the MAS score was higher at both of these time points than it was at Month 2. Representative clinical photographs from a study participant are shown in [Figure 5]. On the questionnaire 'Satisfaction with results of the procedure', there was an overall higher rate of agreement with the statements on Day 14 for the C hand compared with the N hand; however, by Month 2 onwards, there was no difference. This study found that both injection techniques were well tolerated. A review of participants' diaries showed that, during the first hour after the procedure, mild tenderness to palpation, erythema, ecchymosis, moderate edema and sensation of numbness were observed. During Days 1-14, mild AEs were recorded: tenderness of treated areas to palpation, edema, erythema, ecchymosis and implant contouring associated with show-through. All events spontaneously resolved within 2-4 days without any additional treatment. Two participants intermittently complained of mild morbidity and hypersensitivity of the dorsum of the hands when compressed. This occurred bilaterally, was mild and resolved without medical intervention within 6-8 weeks. No serious AEs were observed. Both injection techniques used in the current study achieved similar cosmetic results with Radiesse ® . The responder rates for both techniques were comparable over time, and mean scores on the MAS at each time point were similar for both techniques. 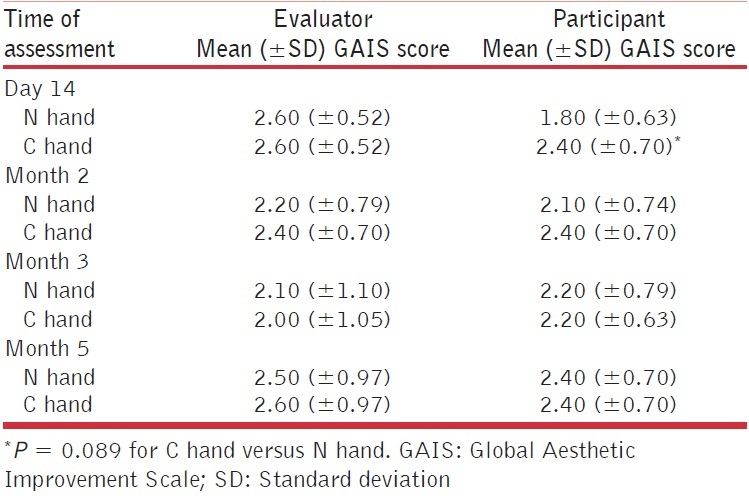 Participant-assessed data show that, at Day 14, better results were noted for the C hand than the N hand. It is likely that this was due to slight swelling that persisted after the more invasive fanning technique, creating the impression of a successful correction of age-related changes (less pronounced atrophy, visualization of the veins and tendons). Indeed, after the period when swelling might reasonably be expected to resolve, there were no significant differences in GAIS score as assessed by either the independent evaluator or study participant. 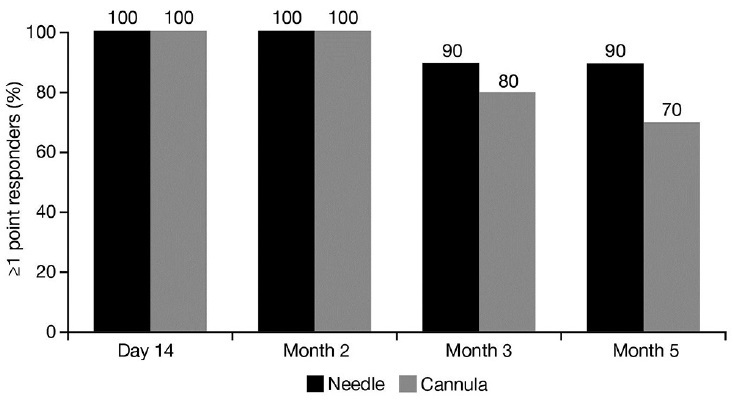 Participant-assessed GAIS scores indicated a high level of satisfaction with both injection techniques, which is an important finding for an aesthetic procedure. A limitation of this study is the small number of participants. Both injection techniques were generally well tolerated and associated with mild tenderness, edema and ecchymosis. None of the AEs reported post-injection were serious, and all events resolved spontaneously. In conclusion, this study demonstrates the efficacy of two different subcutaneous injection techniques with Radiesse ® for the correction of age-related changes in the hands, whether administered by cannula or needle. The authors wish to acknowledge the statistical assistance provided by Maria Y. Rodina MD (Evaluation Center, DME, L'Oreal, Moscow, Russia) and Nina E. Akhtyamova-Givirovskaya (Moscow Region Scientific Research Clinical Institute named after M.F. Vladimirskiy). Editorial support for this publication was provided by Scientific Communications and Information, Oxford, UK and funded by Merz Pharmaceuticals GmbH, Frankfurt, Germany. Shamban AT. 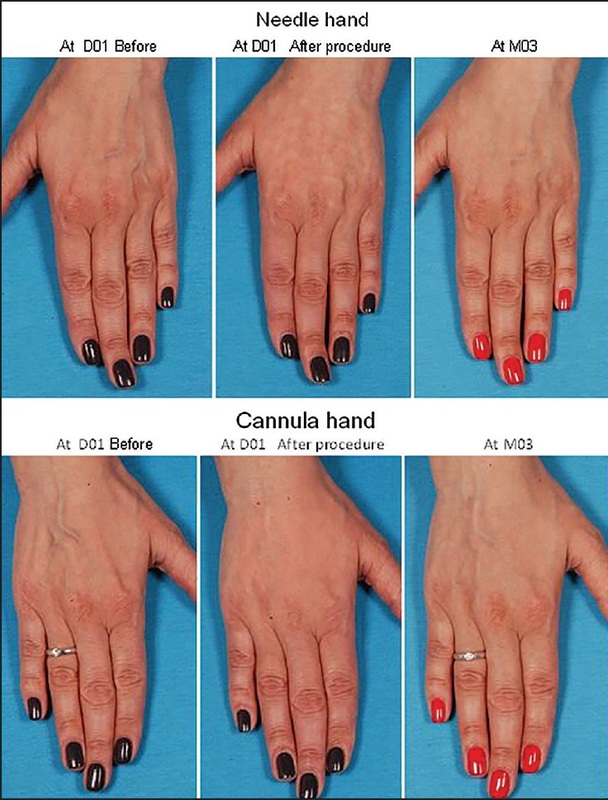 Combination hand rejuvenation procedures. Aesthet Surg J 2009;29:409-13. Coleman SR. Hand rejuvenation with structural fat grafting. Plast Reconstr Surg 2002;110:1731-44. Butterwick KJ. Rejuvenation of the aging hand. Dermatol Clin 2005;23:515-27, vii. Abrams HL, Lauber JS. Hand rejuvenation. The state of the art. Dermatol Clin 1990;8:553-61. Jakubietz RG, Jakubietz MG, Kloss D, Gruenert JG. Defining the basic aesthetics of the hand. Aesthetic Plast Surg 2005;29:546-51. Gold MH, Gallagher C. An evaluation of the benefits of a topical treatment in the improvement of photodamaged hands with age spots, freckles, and/or discolorations. J Drugs Dermatol 2013;12:1468-72. Swinehart JM. Salicylic acid ointment peeling of the hands and forearms. Effective nonsurgical removal of pigmented lesions and actinic damage. J Dermatol Surg Oncol 1992;18:495-8. Goldman A, Prati C, Rossato F. Hand rejuvenation using intense pulsed light. J Cutan Med Surg 2008;12:107-13. Toole BP. Hyaluronan: From extracellular glue to pericellular cue. Nat Rev Cancer 2004;4:528-39. Williams S, Tamburic S, Stensvik H, Weber M. Changes in skin physiology and clinical appearance after microdroplet placement of hyaluronic acid in aging hands. J Cosmet Dermatol 2009;8:216-25. Gubanova EI, Starovatova PA, Rodina MY. 12-month effects of stabilized hyaluronic acid gel compared with saline for rejuvenation of aging hands. J Drugs Dermatol 2015 1;14:288-95. Carruthers A, Carruthers J, Hardas B, Kaur M, Goertelmeyer R, Jones D, et al. A validated hand grading scale. Dermatol Surg 2008;34 (Suppl 2):S179-83. Narins RS, Brandt F, Leyden J, Lorenc ZP, Rubin M, Smith S. A randomized, double-blind, multicenter comparison of the efficacy and tolerability of restylane versus zyplast for the correction of nasolabial folds. Dermatol Surg 2003;29:588-95. Marmur ES, Al Quran H, De Sa Earp AP, Yoo JY. A five-patient satisfaction pilot study of calcium hydroxylapatite injection for treatment of aging hands. Dermatol Surg 2009;35:1978-84. Kühne U, Imhof M. Treatment of the ageing hand with dermal fillers. J Cutan Aesthet Surg 2012;5:163-9.